According to a blessing Milarepa uttered towards the end of his life, anyone who but hears the name Milarepa even once attracts an instant blessing and will not take rebirth in a lower state of existence during seven consecutive lifetimes. This was prophesied by Saints and Buddhas of the past even before his lifetime. Milarepa is one of the most widely known Tibetan Saints. In a superhuman effort, he rose above the miseries of his younger life and with the help of his Guru, Marpa the Translator, took to a solitary life of meditation until he had achieved the pinnacle of the enlightened state, never to be born again into the Samsara (whirlpool of life and death) of worldly existence. Out of compassion for humanity, he undertook the most rigid asceticism to reach the Buddhic state of enlightenment and to pass his accomplishments on to the rest of humanity. His spiritual lineage was passed along to his chief disciples, Gambopa and Rechung. It was Rechung who recorded in detail the incidents of Milarepa's life for posterity. The narrative of his life has thus been passed down through almost a millennium of time and has become an integral part of Tibetan culture. In addition to Rechung's narrative of his life, summarized below, Milarepa extemporaneously composed innumerable songs throughout his life relevant to the dramatic turns of events of himself and his disciples in accordance with an art form that was in practice at the time. These songs have been widely sung and studied in Tibet ever since and have been recorded as the Hundred Thousand Songs of Milarepa. His faithful devotion, boundless religious zeal, monumental forbearance, superhuman perseverance, and ultimate final attainment are a great inspiration today for all. His auspicious life illumined the Buddhist faith and brought the light of wisdom to sentient beings everywhere. Milarepa was born into the family of Mila-Dorje-Senge in the year 1052. His father was a trader in wool and had become wealthy by the standards of the time when his wife bore a son. The son was named Thopaga which means delightful to hear, and Thopaga, later known as Mila-repa (Mila, the cotton clad), lived up to his name as he had a beautiful voice and charmed his companions with his singing. The family lived in a large stone house that consisted of three stories held in place by a large central pillar and supporting columns - a mansion in comparison to the modest homes of his neighbors. The brother and sister of Milarepa's father had also settled in the area along with their families, and the clan would often congregate at the great stone house of Mila-Dorje-Senge. The family was well to do and generous and became the darling of all the relatives and neighbors in the area. They would often gather at the house to enjoy feasts. The gathering of friends and neighbors would often fawn over the small children - the young son Milarepa (then called Thopaga), and his sister, Peta who was four years younger. During this period the family enjoyed the admiration and attention of their neighbors, ate only the finest food and wore nothing but fancy clothes and jewelry. About this time the father, Mila-Dorje-Senge, became gravely ill and accepting his impending death, called together the extended family and made known to all that he wanted his entire estate and all possessions put into the care of his brother and sister until such time as Milarepa had grown and married Zesay, one of the neighboring girls who had been betrothed to him in childhood according to the tradition of the times. After the fathers death, however, Milarepa's greedy Aunt and Uncle who had been given charge of the property, divided the estate between them, dispossessing Milarepa, his mother, and sister Peta of all their worldly possessions. They were forced to live with them in the lowest accommodations and were given only coarse food and even made to work in the fields. Over the ensuing years their health suffered, their clothes were rough and tattered, the heads of the two children became invaded by lice. The mother and her two children who had formerly been the darlings of the village, now became objects of derision and abuse by all, who now spurned and ridiculed them. A Rock Monastery in Tibet "All worldly pursuits have but the one unavoidable end, which is sorrow: acquisitions end in dispersion; buildings in destruction; meetings in separation; births, in death. Knowing this, one should, from the very first, renounce acquisition and heaping up, and building, and meeting; and faithful to the commands of an eminent guru, set about realizing the Truth (which has no birth or death)." But the greedy Aunt and Uncle now claimed that they had been the original owners and had only loaned the property to the Mila-Dorje-Senge family and thus, Milarapa and his mother had no real claim on the property. The aunt and uncle now began indignantly slapping Milarepa's mother and the two children, calling them ungrateful wretches to act thus after accepting the charity of living with them and eating their food. Thus they drove them out of the large stone house to let the mother and children fend for themselves. Some of the relatives and neighbors were sympathetic to Milarepa's family, but they were not sufficient in strength or numbers to oppose the clan of the Aunt and Uncle. And so it happened that the three were turned out of their own house. After that they lived meagerly, supported by the relatives of Milarepa's mother and charity from Zesay's family. The three were forced to work hard, exchanging their labor for a bit of food or a scrap of clothing. During this time they found no joy in their lives whatsoever. One day Milarepa happened to be singing loudly, proud of his voice, when his mother overheard him and was stung to the quick by his unseemly outburst of happiness. She immediately berated him for his transgression in the face of the relentless misery of their existence. She thought over the situation and decided to take action. She wanted him to learn the black arts of sorcery in order to wreak vengeance on their enemies, the greedy Aunt and Uncle. Milarepa agreed that he would apply himself under a good teacher if his mother provided him with fees for the apprenticeship and living expenses. In order to do so, She sold half of the small plot of property that had belonged to her side of the family before her marriage and sent Milarapa off with money. Before he took her leave she very solemnly told him that she would kill herself in his very presence if he returned without having learned sufficient magic to be able to wreak some havoc on their enemies. Milarepa traveled a distance away to a Lama who was known about the countryside as one who was proficient in the black arts. Along with some other young apprentices, Milarepa spent nearly a year learning mostly ineffectual magic rites with high sounding titles. At the end of the year, the pupils were sent off and told that if they applied themselves diligently they would succeed in their quest. Milarepa accompanied his companions for a time as they took their leave but then turned back to the Lama's house. Along the way, he collected a quantity of manure and dug a hole and buried it in the Lama's garden as a small gift to his teacher. The Lama observed this from his roof, and is said to have remarked that he had never had a pupil more affectionate and industrious as the young lad Milarepa was. The latter, went in to the Lama's presence and told him of his mother's vow to kill herself in his presence if he didn't learn some real magic. He then recounted his tale of woe in all its detail to the Lama who was greatly saddened by the story. The Lama decided to confer some real power on Milarepa but he wanted to make sure that the magic would not be used unjustly so he sent a fleet disciple to Milarepa's homeland to find out if the tale was true. On the disciples return, he agreed to show him the true and potent rituals for invoking the Tutelary deities to take revenge. Milarepa absorbed all the teachings thoroughly and carefully carried out the prescribed ritual for 14 days. At the end of the ritual the Tutelary deities appeared to him in a vision with the bloody heads and hearts of 35 of the relatives who had most ill-treated him. The Lama informed him that two of the guilty ones had been missed and asked Milarepa if he wanted their lives as well. He replied that he wanted them to be spared as witnesses to the power of his magic. Thus it came to pass that his two very worst enemies, the greedy Aunt and Uncle were spared from harm. From a phenomenal aspect, the sorcery took the form of a disaster that occurred at the family wedding. All the relatives and friends who had been most offensive to him had gathered at the great stone house to celebrate the wedding. There was a big commotion outside and some of the horses kept in the yard started kicking and running about violently agitated, until one of them ran into the main supporting column of the three story house with such force that the entire house came crashing down on the wedding party with tremendous noise and force killing everyone inside except for the Aunt and Uncle. All this was observed by some of those sympathetic to the Milarepa family who were just approaching the house. Milarepa's mother quickly learned of the catastrophe and was ecstatic with cruel joy. She came gloating over the destruction that her son had caused telling everyone what joy her son had brought to her aging heart by causing so much death and destruction. The relatives of the dead were quite upset at the tragedy and more so to learn of her gloating. They talked it over but were divided on whether to get together and kill her in revenge, or to go after her son Milarepa, who had directly caused the destruction. After due consideration they decided to find and kill the son. Soon word of their plans got back to the mother so she sent a message to her son, along with several gold pieces she got from selling the remaining half of her plot of land. In the note she described her joy at his success and requested him now to launch a powerful hail storm on the area, ruining the crops of their enemies and striking fear into their hearts so as to prevent further retaliation. Milarepa received the note from the pilgrim courier and gave the gold pieces over to the Sorcerer-Lama, requesting him to teach him the art of launching hail storms. Armed with his new magic, Milarepa traveled incognito back to his homeland and set up his ritualistic site on a hillside overlooking the valley of his homeland below. He began his incantations and soon dark clouds began to gather and then a succession of three powerful hail storms utterly ruined the entire barley crop of that year, a crop that had promised to be one of the heaviest in years. After the destruction, Milarepa retreated to a cave in the hillside to escape the cold wind and lit a fire for warmth. After a few hours he heard some of his former neighbors walking by the cave he had taken refuge in. They had guessed who was responsible for this fresh mischief and were immensely angered by the all destruction he had caused, first to the 35 people killed in the wedding party, and now to the season's rich harvest of barley - utterly laid waste. The men were talking amongst themselves, saying as they walked past the cave that if Milarapa fell into their hands at that very moment, their vengeance could hardly be satisfied by chopping his body into tiny bits; such was their anger. At that instant one of them spotted the fire and guessed that it was Milarepa himself taking refuge in the cave. They hurried quickly and quietly away to go gather a party to go after him. Meanwhile as soon as they had left, Milarepa made good his escape and journeyed back to the Sorcerer-Lama. Heaped-up accumulations will only enrich others. Desire for fame will lead to ruin and to lawsuits"
The Lama congratulated Milarepa on his success but by now Milarapa was deeply repenting all the evil deeds his mother had urged him to commit. He longed for religion and wanted to be delivered from committing further evil acts. He worried greatly over the heavy debts of karma he had incurred through his evil actions and could think of nothing else. He wanted to ask the Lama Guru for religious instruction but didn't have the nerve to broach the subject so he stayed on, faithfully serving the Lama and waiting for an opportune moment to bring up the subject of his salvation. The Lama now was called away to attend to one of his followers who had died after a short illness. The Lama returned lamenting that such an excellent man in the prime of his life had died so suddenly. He spoke on the transitoriness of life and the misery of this earthly existence and then started ruminating over his own life. He had spent his entire life up to that point practicing the art of dealing death and destruction and teaching those same black arts to many others. By doing so he had to take at least a portion of the karmic responsibility for all the evil acts that had come out of it. In his mood of deep remorse, he urged Milarepa to go and seek out a teacher of the Holy Dharma and at least deliver himself and maybe even the Lama into a higher state of existence in a future life. This was precisely the opportunity Milarepa had been waiting for. He prayed to be allowed to take to the religious life and his teacher readily agreed, giving him gifts and a letter of introduction to a well known Lama versed in a doctrine called "The Great Perfection". Milarepa went to the Lama and requested to be taught. The Lama gave him some meditation instructions and told him to go practice but after a few days, the Lama had an insight that he was not the proper teacher for Milarepa, so he sent him on to a very learned Lama he knew of named "Marpa the Translator". 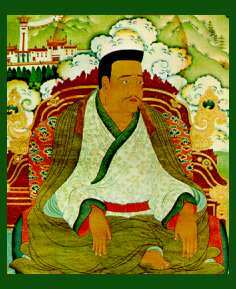 Marpa was known widely among other religious centers for his trips to India to procure sacred teachings which he had brought back to Tibet in large bundles of scrolls. Marpa had been initiated by the famed Naropa, a powerful Saint who had fully transferred his exalted state of enlightenment to his disciple Marpa. 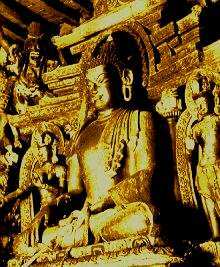 He gained enlightenment under Tilopa. 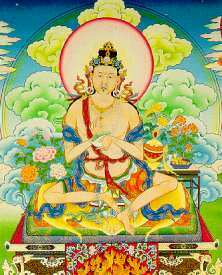 Tilopa is believed to have been an incarnation of Amitabha - the Buddha of Boundless Light. When Milarepa first heard the Lama utter the name "Marpa", he felt a thrill go through his body. Suddenly all his hairs stood on end and tears of joy started flowing from his eyes. He set out thinking of nothing else but the moment he would finally set eyes on his new guru. Meanwhile, the day before Milarepa arrived, Marpa the Translator had a dream in which his own Guru, the Great Saint Naropa appeared to him and gave him a five pointed dorje (i.e. sceptre) made of the precious gem lapis lazuli. The dorje, however, was slightly tarnished and Naropa urged him to wash the dirt off with an elixir of holy water from a golden pot until it shone in splendour and then to raise it up upon a Banner of Victory. In his dream Marpa saw that the dorje, once polished and raised up emitted a brilliant radiance that shone on all the sentient beings in the six Lokas (the physical and spiritual realms or worlds). In his dream, the spectacle of the radiant dorje was blessed with the benedictions of the Victorious Ones (previous humanity who had passed into the state of Buddhahood, or enlightenment). Marpa was a member of the Kargyutpa sect and one of the specialties of the lineage was to divine future events through the reading of omens. From the dream he knew that a momentous meeting with his chief disciple was about to take place and that his task was to expiate some evil karma by which the disciple had been tarnished and then to bring him to the state of enlightenment. Marpa left his house telling his wife Damema that he was going to plow his field that day, a thing he had never done before. Marpa walked down the road a ways and kept busy at the plowing until he spied Milarepa coming up the road towards him. As soon as Milarepa approached and laid eyes on the Lama Marpa, an inexpressible bliss gripped him and for a few moments he lost consciousness of his surroundings swept up in an ecstatic state. As soon as he had recovered he addressed Marpa as Reverend Sir and asked him where he might find the faithful disciple of the famous saint Naropa who was called Marpa the translator. Milarepa added that he wanted to learn the True Doctrine by which he might obtain Deliverance in one single lifetime. At this Marpa was inwardly pleased but he showed no emotion and only said that he would procure an introduction to the Lama Marpa if only Milarepa would finish the task of plowing the field. Marpa offered Milarepa some chang (barley beverage) as refreshment. Milarepa thanked him and drank the entire quantity of chang offered. Milarepa then plowed the field with enthusiasm and even when one of the disciples came to call him to the Lama's presence, Milarepa asked him to wait until he had finished plowing the field thoroughly and completely as requested by Marpa. Marpa took these two omens as signs of his new disciple's thoroughness and willingness to work towards the spiritual goal. After that initial meeting began a period during which Marpa held out the goal of spiritual instruction and kept Milarepa busy at strenuous physical labours building various stone edifices. By nature Marpa was outwardly a rough and tyrannical teacher but inwardly he was all love and compassion. By the previous omens and Milarepa's recounting of his evil deeds, Marpa knew there was a great deal of evil karma to be worked out so he pretended to be always short tempered and demanding with the sincere and faithful lad. He had Milarepa build a stone structure on a high rocky ridge only to have him tear it down again, and take all the rocks and boulders back to where they were found, telling him he had changed his plans and now wanted a new structure built in another place. 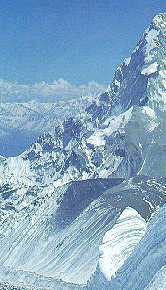 This was repeated on three different ridges until finally he had Milarepa build a grand many storied edifice on yet a forth ridge. Throughout the tasks, Milarepa never lost faith that he would receive the instructions he was looking for and put forth a Herculean effort, moving stones that ordinarily could only be moved by the combined strength of three men. He put forth such strenuous effort that he wore his body out until his back was one great sore from carrying rocks and mortar. His arms and legs were all cracked and bruised. Yet he continued working on, every day hoping at last to be favored with some religious instruction. Out of sympathy with his wounds, Marpa showed him how to pad his back and allowed him to rest while his body healed, but never did he allow Milarepa to avoid any of the building work that he had set out for him to complete. During the years when all this building was going on, Marpa continued giving instruction to his other students. On several different occasions, various individuals among the disciples underwent initiations to receive the sacred instructions and Milarepa would try to join them but the Lama would drive him away with angry shouts and fierce beatings, causing him great mental distress. Each time Milarepa would be plunged into deep despair thinking that Marpa's actions were due only to the evil he had previously done. Sometimes Milarepa considered taking drastic action but each time he was on the verge of either taking his own life or running away, Marpa's wife, Damema, would give him sympathy and comfort, telling him the Lama would surely soon favor him with some instruction. Soon another opportunity for instruction presented itself with the grand initiation of some disciples into the Mandala rite of Gaypa Dorje'. Marpa's wife Damema secretly gave a rare colored turquoise which had been in her family to Milarepa as an offering of the initiation fee and then urged him to take his place once again with the other participants to the initiation. When the time came for the ceremony, Marpa approached Milarepa, carefully examined the turquoise and asked him how he came to possess it. Milarepa had to confess that the Reverend Mother (Damema) had given it to him. In reply Marpa merely told him that if he had anything of his own to offer he could stay. Thinking that maybe the Lama would soften and allow him to take initiation, Milarepa stayed on a while and waited. But this only made Marpa furious (at least outwardly) and he threw young Milarepa to the ground with great force and made as if to beat him with a stick. At this the young lad felt as if his heart was breaking, and weeping openly he left the house. The next day the Lama summoned him and asked him if his refusal to confer initiation on him had shaken his faith. Milarepa replied that he only considered that it was the result of his own evil deeds which had prevented him from taking his place in the ceremony, whereupon he burst into tears anew. At this, the Lama ordered him out in an angry voice, asking him how he dared try to blame the Lama for this by his weeping so in his presence. Again Milarepa was sunk into the utmost despair feeling as if his heart were being torn out. Milarepa went off by himself and thinking things over he concluded that the Lama never would confer on him the spiritual truths he was seeking and that he would have to seek them elsewhere. So he sought out Damema and told her of his plans to find another Guru. She reluctantly agreed that it appeared the Lama never would give him any instruction. Therefore she gave him some relics of Marpa's Guru Naropa as a gift and sent him off to another highly developed Lama, Ngogpa, who was of the same sect as Marpa. She wrote a note asking Lama Ngogpa to teach Milarepa some religious instructions and then sealed the note with Marpa's own seal. After a short journey to the Lama's monastery, Milarepa arrived just as Lama Ngogpa had reached an auspicious point in a lecture to a large number of his pupils. He was reading: "I am the Expounder and I am the Truth. I am the Teacher of the World. I am the Being who has passed beyond all states of worldly existence. I am the Blissful one." Just as he said these words, he looked up to see Milarepa prostrating before him in salutation. The Lama took this simple sign as an omen that Milarepa would one day become a master of all religious lore. As soon as Milarepa presented the Lama with Naropa's sacred relics and the note requesting instruction, the Lama was overjoyed to be so favored with such auspicious gifts and he then ordered a great celebration. Lama Ngogpa had heard about the Great Sorcerer (as Milarepa was called) staying with Marpa and had thought about sending for him. The Lama explained to Milarepa that many of his pupils had been waylaid and robbed of their meager possessions and supplies by the lawless inhabitants of one of the nearby provinces as they journeyed to and from the lamasery. He therefore dispatched Milarepa to launch a powerful hailstorm on the area. He promised Milarepa that as soon as this was accomplished, he would give him the instructions he sought. Now Milarepa bitterly repented his fate that instead of getting religious instruction, he was now being asked to commit still more evil acts. But he saw no way he could refuse so he set out for the province and set up his apparatus on a hillside and began the rites. Soon a large and violent storm gathered and let loose huge quantities of rain and hail. After the storm had passed he saw that the fields of grain had all been wasted, the hills around were deeply cut by ravines, and many of the domestic animals of the residents as well as even birds, rats, and other animals had perished in the storm. Finding a shepherd who had lost his entire flock, Milarepa made known to him that the people of the province had better refrain from robbing the religious pilgrims passing through the area or risk having more disastrous hail storms visited upon them. On hearing of this the people were profoundly impressed with the power of Lama Ngogpa and not only refrained from robbing the pilgrims in the future, but many of them became devoted followers and faithfully served him. Milarepa returned to the Lama in despair bewailing the fact that he came to the Lama searching for religious teaching but instead had been required to heap up even more sin. The Lama comforted him by telling him that all that had perished in the flood would in future times become themselves pupils on the path to Buddhahood. Lama Ngogpa now fulfilled his promise to Milarepa and initiated him into the sacred rite of the Mandala of Gaypa Dorje. Milarepa was then conducted to a solitary cave where he was walled up inside of it with a stone wall held in place with mud as mortar. Now he was to commence his meditation practices. A small aperture was left for handing in food and water. Milarepa followed the Lama's meditation instructions with great zeal but despite a prodigious effort on his part, he failed utterly to experience any kind of spiritual development. After a while the Lama came to him and asked him if he had experienced such and such to which Milarepa replied in the negative. The Lama was greatly puzzled as even the least advanced pupil should have had at least some measure of experiences by that point. Milarepa was inwardly alarmed by this and guessed that it was because he did not have Marpa's blessings. He was afraid to say anything though so he kept quiet and the Lama directed him to continue with his practices. At about this time, Lama Ngogpa received a summons from Marpa to join him for a great religious event. The letter also stated that Lama Ngogpa should return the "wicked person" who had taken refuge with him. The Lama went to Milarepa's cave and read the letter to him. At this Milarepa confessed that indeed, it was not Marpa that had sent him there for instruction, but his wife, the Reverend Mother Damema. The Lama then stated that in that case, they had been engaged in totally profitless work. Lama Ngogpa now collected all his pupils and taking a large number of objects and all his livestock as offerings in the ceremony, they proceeded to the residence of Marpa. When they were a short distance away, Lama Ngogpa sent Milarapa ahead to inform Marpa that they were near so that he could send some disciples back with refreshments (according to Tibetan custom). Milarepa hurried to Marpa's residence and first encountered Damema. They greeted one another with great joy like reunited mother and son. She then told him to go inside and pay his respects to Marpa. Marpa was on the top floor of the house and when Milarepa approached from one direction, Marpa turned in another. Milarepa approached him again and Marpa turned back in yet another direction. Then Milarepa informed him that though he was unwilling to accept his own obeisance, Marpa should at least prepare a reception for Lama Ngogpa's party who was now only a short distance away. Marpa became enraged at this and replied that when he himself had returned from India with a load of precious teachings, not even as much as a lame bird hopped out to greet him. At this Milarepa left to find Damema. The two, along with some of Marpa's disciples went back with a quantity of chang to greet Lama Ngogpa's party. Once the entire group had assembled, the religious consecration of the completed residence of Marpa's son was carried out. Then a few days later, Marpa conferred on Lama Ngogpa the final ear whispered teaching that he lacked - the Short Cut of the Immutable Path - through which it is possible to attain to Nirvana in a single lifetime. After this Marpa put on a great feast, including his own disciples and all those who had assembled there from far distant locations. During the feast, Marpa sat looking fiercely at Lama Ngogpa and suddenly pointing an accusing finger at him and glancing at his long staff he had by his side, he demanded that the Lama account for his inexcusable behaviour in granting teachings to the wicked and evil Milarepa. The Lama was terrified and replied to him that he had only carried out the instructions that Marpa himself had written in his letter, signed with his own seal and accompanied by the relics of Saint Naropa to show their authenticity. Marpa then turned on Milarepa and demanded to know where he got the relics of Naropa to give to the Lama. Milarepa shrunk in terror and felt his soul within sinking. He quickly passed from a state of extreme terror to one of extreme anguish, feeling once again as if his heart were being torn out. He began trembling and could scarcely talk for his terror. He felt compelled to inform Marpa that the Reverend Mother Damema had sent him to the Lama with the note and the relics of Naropa. At this Marpa turned fiercely to Damema to accuse her, but anticipating just such an event, she had already escaped the room and went into the chapel, barring the door behind her. Marpa then demanded that Lama Ngogpa return to his monastery and bring back the garlands and rosary of rubies that had once belonged to the great saint Naropa. The Lama left immediately to do so and encountered Milarepa outside who had also made his escape when the Reverend Mother had run out of the room. Milarepa was in a corner weeping from the deepest depths of despair and he asked the Lama to please ensure that he would get a proper birth in his next life with a chance to attain enlightenment. He explained that because of all the evil deeds he had committed he had not only had made himself suffer but had also involved the Lama and the Reverend Mother in his suffering. He had now lost all hope of attaining teachings in this life and in his despair, planned to take his own life on the spot. The Lama himself burst into tears at this and pleaded with Milarepa not to take his own life. He informed him that the Mystic Doctrine held that all the various bodily principles and faculties are divine and that to prematurely end the present life before it's natural period of dissolution was the greatest sin of all incurring the severest of punishments. Then Lama Ngogpa sought to comfort Milarepa as did many of the disciples who joined in to offer their own sympathies. 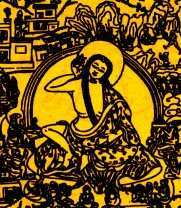 But Milarepa remained in deep despair, bitterly repenting the black deeds he had previously committed that were now producing all his present suffering. Meanwhile all the anger seemed to drain out of Marpa and he became calm and mild and asked one of his disciples to go and bring Lama Ngogpa, Damema, and Milarepa back into his presence, but this made Milarepa even more despondent. He envied the others, called back to Marpa's presence, but as for himself, he knew that his teacher would only show fresh displeasure at him if he returned with the others. So he remained there still weeping with despair and Lama Ngogpa remained with him to soothe him and make sure he didn't do anything rash. Marpa now sent Damema to request Milarepa to return saying that he was now to be the honored guest. Damema went to him smiling broadly and told him that it appeared that Lama Marpa was now really going to favor him with some teaching. Milarepa very much doubted that this could be so but nonetheless returned with the others and all took their seats around Marpa. Now Marpa made a detailed recounting of all that had occurred from the time he first met his worthy disciple. He first said that he had set Milarepa at hard labor building various edifices to help absolve him of his sins. His own anger, he said was not common anger, but spiritual or religious anger and it had as its aim to incite repentance and contribute to the spiritual development of the recipient. If he had had the chance of plunging his spiritual son (Milarepa) into abject despair nine times he would have been able to cleanse him completely of all his sins. But owing to the misplaced pity and narrow understanding of his wife Damema, who had interfered with his plans, he was only able to do this eight times. However, the sufferings that Milarepa had undergone had cleansed him of his major sins and his other chastenings had cleansed him of most of his minor sins leaving him with only a residual amount of demerit to be worked off. Now Marpa announced that he was going to finally confer on Milarepa those initiations and teachings of his sect that bring liberation in a single lifetime and then he planned to shut him up in a cave to begin his meditations. Milarepa was not sure if he were dreaming or awake but if dreaming he wished the dream to continue and began to weep, not out of misery, but for the pure inexpressible joy that was now possessing his soul. He made obeisance to the guru Marpa and all those present admired Marpa for his stern and inflexible will while chastening Milarepa, and for his wisdom and mercy in working out his salvation. All were now beaming and smiling as they partook of the sacrificial cakes. The next day, Marpa erected the Demchog Mandala and through mantras, invoked the presence of the deities who presided over the succession of gurus in the Kargyutpa Sect of which Marpa was now the current youngest lineage holder. Milarepa now had the vision of the presiding tutelary deities invoked by the Mandala, thus receiving their benediction on his initiation. Then Marpa gave him instruction in the methods of meditation and explained the meanings of all the omens and events that had occurred since the initial meeting of the two. He told Milarepa that he in his turn would have disciples full of faith, intelligence, and energy, owing to his own patience, faith and acceptance in all the trials he had undergone during his cleansing period. Now Milarepa began his meditation training. Marpa shut him up in a cave with a supply of provisions. Milarepa used to start his meditations each day by putting a lighted lamp on his head. He would continue meditating until the lamp went out. After eleven months of this Marpa and Damema came to take him out of isolation and assess his progress. Milarepa was reluctant to take a break from his meditations because of the great progress he was making but he followed his Guru's dictates. Marpa now asked him what understandings he had obtained from his meditations. Milarepa first sang a song which he extemporaneously composed honoring his Guru and his wife and the teachings he had been given. In his song he requested that Marpa remain in the world until "The Whirling Pool of Being is emptied". After that he summarized his realizations. All the efforts put forth during this path must be made in a spirit of compassion with the aim of dedicating the merit of one's efforts to the Universal Good. There is a need of mentally praying and wishing for blessings on others so earnestly that one's mind processes also transcend thought. After the recounting, Marpa was exceedingly pleased and told Milarepa that he had expected much but that his expectations had all been exceeded. 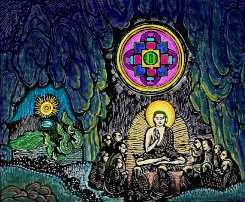 Milarepa was then allowed to go back to the cave for more meditation. By now Marpa was getting on in years. Since he began teaching Milarepa, he had made two more trips to India to visit his Guru Naropa and receive the final texts he had not brought back in his earlier trips. Marpa now called together all his chief Lamas and disciples, including Milarepa, and gave to each those mystics texts that would be most valuable according to each person's line of development. Each also received some relic that had belonged to Naropa. To Milarepa was given the teaching of Tum-mo in which the ascending and descending flows along the spinal column are united to produce the vital heat so necessary for meditation in the cold and solitary caves of the Himalayas. Then all returned to their own province except Milarepa who continued for several more years of meditation in a cave under the direction of Marpa. Usually Milarepa never slept but meditated continuously, however one particular day he had slept for a long time and had a vivid dream wherein he saw the house he had lived in as a child all in ruins. He saw his sacred books within the fallen house being wasted by rain water, his old mother had died, and his sister was roving about the countryside with no attachments and no friends. In his dream he was weeping with great sadness and longing for his mother and sister and he woke up feeling very sad. He tried again to meditate but could not shed his sadness; instead the feeling grew stronger and stronger until he vowed to himself to go out into the world and try to find his family. So he pulled down the rock wall and went to see his guru Marpa. As he entered Marpa's quarters he found him asleep with the rising sun just lighting his head like a halo. Just at that moment, Damema came in with his morning meal. 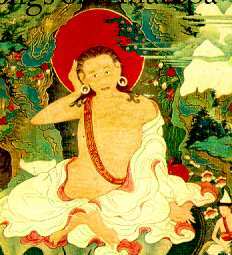 Marpa awoke, alarmed to find Milarepa had left his cave retreat. Milarepa explained that he was overcome with sadness thinking of his beloved mother and sister he had left behind many years ago. He explained to Marpa his great longing to see them once more. Although Marpa felt there was little chance in finding the mother alive and little merit in making the search, he agreed to allow him to go. But, he warned, the fact that Milarepa had entered his quarters and found him asleep was an omen that they would not see each other alive again in this life. Marpa was much grieved at heart thinking he would not again see his spiritual son alive but knowing this was the way of all the perishable things of the world, he requested Damema to deck the alter with offerings for their parting ceremony. He then gave Milarepa the final and highest initiation as well as the sacred ear-whispered tantric doctrines. These doctrines he gave only to Milarepa, among all his disciples. He charged Milarepa in his turn to hand them down to his most worthy disciple and so on for thirteen generations. Then in a final ceremony with the entire assembly of Lamas and disciples, Marpa occultly manifested himself in the forms of Gaypa Dorje and other of the tutelary divinities of the Kargyutpa sect and also other divine shapes and forms along with the various symbols associated with each deity such as bells, gems, lotuses, swords, etc. He then explained that these were various psycho-physical powers obtained after enlightenment and that they should never be manifested for an unworthy cause. This was his parting gift to Milarepa, and this, his spiritual son, greatly exalted in his heart to see that his Guru Marpa was veritably a Buddha himself. He vowed that he himself would gain such powers and show them in his turn to his own disciples. Marpa then told him that he could now depart since he had demonstrated the mirage like nature of all existing things. He instructed Milarepa to meditate in various caves made holy by previous saints in the locale of Mount Kailas, Lapchi Kang (Mt. Everest), and other sanctified places. He then gave to Milarepa a sealed scroll that was to be opened only on dire threat of imminent death. With great sadness, knowing they would not meet again in the present life, Milarepa took leave of his beloved Spiritual Father and Mother with the thought that they would all meet again in the celestial realms. He journeyed quickly to his homeland, crossing several high and dangerous mountain passes to get there. When he arrived he found things just as he had seen in his dream. His mother had died, his house was in ruins and all the neighbors were afraid to go near it thinking it inhabited by evil ghosts. His sister wandered homeless, none knew where. His field was choked with weeds. He entered the ruin that was his house and found a mound with grass growing thickly over it. Moving the dirt he found the bones of what he knew to be his mother. He had the unbearable thought that he would never see his mother again and a deep sadness gripped his soul. He wept bitterly in his loneliness. Remembering his Guru's teachings on the transient nature of reality, he laid down using the mound as a pillow and entered into deep meditation. He soon passed over into the samadhi state in which he remained for seven days. On returning to normal consciousness, he reflected that the world now had nothing left to tempt him or bind him to it. He vowed again and again to himself that the life of solitary meditation was the only path for him. Exchanging his house and land for some food, he left forever his former homeland and proceeded to the Draktar-Taso Cave, the first of many caves he was to inhabit over the remainder of his life. "Life is short and the time of death is uncertain; so apply yourself to meditation. Avoid doing evil, and acquire merit, to the best of your ability, even at the cost of life itself. In short: Act so that you have no cause to be ashamed of yourselves and hold fast to this rule"
There he settled in the spacious comfortable cave, not even sleeping, but meditating continuously except for a single break once a day to prepare a meal of flour and water mixed with whatever root or edible he might find. At about this time Milarepa gained proficiency in the yogic power of Tum-mo, the generation of the Ecstatic Internal Warmth, in which the body generates a great deal of heat. This allowed him to stay relatively warm through the cold Tibetan winters with nothing but a thin cotton covering whereas most people had to wear thick wool and leather hides. For this reason he came to be called Mila - repa or Mila the cotton clad. His daily routine of meditation continued for four years until his supply of flour ran out. This caused him great concern because he had vowed to himself not to return to the world for any reason - but with no food, he was afraid he might die without having attained liberation. He decided to walk about outside the cave in search of some kind of food. Not far from the cave he found a sunny spot with springs of fresh water, an expansive view of the area, with a large quantity of nettles growing all about. He made a soup of nettle broth and found it to be somewhat palatable. This was now to become his sole source of food for some time to come. He continued his meditations on his new diet, but without any nurturing food, his body soon became emaciated and the hair on his body began to take on a greenish tinge from the nettles. He became very weak and often thought of opening the scroll that Marpa had given him for a time of dire need. But he continued to make progress in his meditations. About this time some hunters chanced to be in the area after failing to find game. When they first laid eyes on Milarepa's pale green form, they fled in terror thinking he was not a man but some kind of evil spirit. But on assuring them he was indeed a human like themselves they lost their fear of him. They demanded that Milarepa share some of his provisions with them as they were out of food but Milarepa told them he had none to share. They did not believe him, so they searched the area and not finding any began to ill treat him. Three of them picked him up several times and dropped him causing him great pain but in his misery he only pitied them and shed tears thinking of the evil karma they were creating for themselves. The fourth hunter entreated the others to stop ill-treating him and leave him alone as he did indeed seem to be a real lama for showing such forbearance over his ill treatment. Before leaving, the fourth man requested Milarepa to remember him in his prayers since the man had done nothing to offend him, and then the group of them left, laughing boisterously. Later Milarepa learned that Divine retribution had overtaken them as they were arrested by the Governor of the province. The leader was killed and all but the fourth man, who had restrained the others from harming Milarepa, had their eyes put out. The meditation continued and Milarepa grew even thinner. The hair on his body took on a more greenish color. Again some hunters chanced upon his cave and also wanted provisions but seeing that he was living only on nettles, they left him the remainder of their own provisions and a large quantity of meat. Milarepa was very grateful to have some real food and he began to take some daily. The food gave him a sense of bodily comfort and spiritual zeal which he had not experienced in a long time and his meditations took on a new intensity. But eventually the food ran out and once again he fell back on his nettle broth for sustenance. (Mt. Everest) "Maintain the state of undistractedness and distractions will fly off. Dwell alone and you shall find a friend. Take the lowest place and you shall reach the highest. Hasten slowly and you will soon arrive. Renounce all worldly goals and you shall reach the highest goal." Approaching the cave, Peta was horrified to see the emaciated green body of her brother, with protruding bones and eyes sunk in his skull. At first she took it to be some strange being or ghost but recognizing her brother's voice, she ran to him crying and bewailing their fate. She expressed to him that they two were the most luckless people in the whole world. At this Milarepa explained that rather he was the most fortunate person in the world because he had attained to transcendent knowledge and Bodhi mind (the internal vision of a Buddha). But his sister felt he was only deluding himself. Peta had brought provisions and a supply of chang and after partaking of some food his mood was greatly elevated. However when he tried to meditate afterwards his mind was filled with a mix of pious and impious thoughts and he was unable to concentrate. A few days later both the sister, Peta, and his betrothed, Zesay, came to visit him bringing cured meat, flour, butter, and chang. They chanced to come upon him when he was out getting water and he had absolutely no clothes on since his wearing cloth had fallen into tattered pieces over the years. His sister told him that no matter how she regarded him he seemed not to be in any way a sane person. They both urged him to at least go out begging for supplies on occasion. Then they went to get some cloth to cover his body with. But Milarepa felt that the hour of death was uncertain. his Guru had told him that his only avenue of success in this life was through continued meditation. He himself was afraid that if he didn't reach enlightenment in this very life, he would be reborn in a lower state due to the evil he had committed early in life, and so he ignored their advice and persevered in his meditation. He finished the chang that Peta had brought and was eating well from the food left by Zesay but he found that his mind was now disturbed and his body was experiencing various pains. No matter how hard he tried to meditate he could no longer enter the samadhi state. Feeling there was no greater danger than not being able to continue with his meditations, he opened the scroll that Marpa had given him for just such a time of dire emergency. In the scroll he found the exact instructions needed for treating the present emergency and he immediately put the instructions into effect with the result that his meditations now increased as never before because of the healthy food he was now eating. The knot of the central spinal column along which the psychic energy flows was now cleared at the plexus (i.e. chakra center) below the naval and the psychic energy current rose up his spine in its fullness. He now experienced a supersensuous calmness and clearness that far exceeded in its ecstatic intensity any of the states he had previously reached. He attained to new heights of realization in which he saw that the highest state of Nirvana and the ordinary state of Samsaric consciousness were but opposite and inseparable states resting on the base of the Voidness of Universal or Supra mundane Mind (ie Ultimate Awareness). In his new realization he could clearly see that the samsaric or phenomenal existence results when the Universal Mind is directed along the path of self centered and self oriented awareness, and that the Nirvanic state of transcendence results when it is directed on the path of selfless or altruistic awareness. Greatly encouraged by this new development, Milarepa redoubled his zeal and began to develop the siddhis or yogic powers that accompany full enlightenment. His production of the inner vital heat also developed fully so that he could easily sit amongst the frozen snows and melt the ice into water. A few of the people he had encountered now knew about his siddhis (psychic powers) and so Milarepa determined to go to even more isolated caves to prevent a steady flow of people coming to him with selfish aims. As he was about to leave the area, his sister Peta came once again bringing him some cloth for him to fasten into a garment for his naked body. She remained a while and he tried to talk her into taking to a life of meditation with him. But the very thought was repugnant to her and she saw only his great deprivation. To her, he was the most miserable person on the earth and she felt that even though she had to beg for her own food and clothes, her life was far better than his. She tried to talk him into becoming a lama of the people so that they might bring him offerings in return for religious blessings. Milarepa saw that he would not be able to convert her to a religious outlook so he at least explained to her the doctrine of karma (i.e. the law of retribution) so that she would at least refrain from incurring any fresh debts from harmful actions. While Peta was visiting, their evil Aunt arrived, the aunt who had started the entire chain of events so many years back by seizing the property of Milarepa's widowed mother. Peta saw her approaching and tried to prevent her from reaching the cave by withdrawing the bridge that spanned the chasm to the other side, but the Aunt pleaded to be heard. Her brother, the evil Uncle who had conspired with her, had died, and she now deeply repented all she had done and so she had brought a yak load of supplies and found Milarepa by asking about in the villages until she was told a wandering monk resembling a green caterpillar had indeed been through the area. Milarepa finally agreed, although reluctantly, to talk to her and he delivered several religious discourses to her reminding her of all the sufferings and misery she had inflicted on them. In her state of misery, the Aunt took his teachings to heart and went on her way having been converted to a path that would confer eventual liberation. The sister Peta now also took her leave, having her mind somewhat turned to religion. Milarepa now removed to Lapchi-Kang (Everest) and continued his meditation amidst the snows and isolation there. Altogether he meditated in and made holy twenty caves covering the region from Mount Kailas and Lapchi-Kang in Tibet to far off Nepal. It is said that besides his many human converts he also brought to enlightenment some superhuman (ie non-embodied) beings as well, including the Goddess Tseringma (one of the twelve guardian deities of Tibet who reside at Mt. Kailas). The Goddess came to tempt him with her powers during his meditations and instead was herself liberated. During his travels over the 84 years of his life he met many worthy disciples that were destined to come under his tutelage. Highest among the disciples was Dvagpo Rimpoche (Gambopa). The most well known among them was Rechung who entreated him to tell in detail the story of his life (summarized in this narrative) which was recorded for the benefit of all sentient beings, even into the far future. These two disciples were respectively like the sun and the moon. The most exalted of beings met by Milarepa was a Maha-Purusha (Great Being) he had the excellent fortune of meeting - an Exalted Being mentioned by the Buddha himself as one of the guardians and protectors of the human race who live on through the centuries far from human habitation. Besides his two chief disciples, Milarepa had 25 additional highly accomplished disciples, both men and women, who became saints. Another hundred made such progress that they did not take rebirth. Another hundred and eight Great Ones obtained excellent experience and knowledge from meditation. A thousand sadhus and yogis, both men and women, renounced worldly life and lived lives of exemplary piety. Innumerable lay disciples formed a religious relationship with Milarepa so that the gateway to lower states of existence was closed to them forever. Thus did Milarepa radiate spiritual light like a beacon, drawing vast numbers of sentient beings forward toward the light of deliverance and dispelling in all directions the darkness of selfishness and ignorance. These falling on the Earth unceasingly, nourish and ripen the harvest of Saved Beings "